A few years after his Presidency, Dr. Sheldon became founding Editor-in-Chief of the ACS Web portal, which now has hundreds of editors and millions of page views. As recently as a month before he died—and after his first hospitalization for heart failure—Dr. Sheldon sent the ACS leadership a formal request to renew his contract as Web portal Editor, dismissing his health issues as unimportant. ACS Executive Director David B. Hoyt, MD, FACS, renewed the contract immediately. Dr. Sheldon was also the driving force behind the ACS Health Policy Research Institute initially located at the Cecil G. Sheps Center for Health Services Research at UNC and now headquartered in the ACS Division of Advocacy and Health Policy’s Washington, DC, Office. 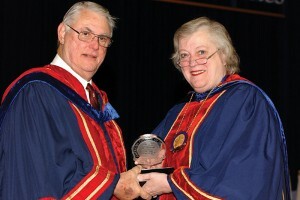 The ACS recognized the extraordinary service of Dr. Sheldon with a Lifetime Achievement Award during Convocation ceremonies at the 2012 Clinical Congress in Chicago, IL—only the second such award presented in the College’s 100-year history. 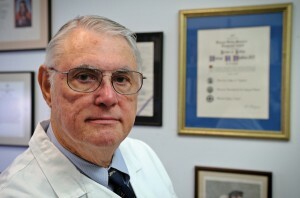 The first recipient was C. Rollins Hanlon, MD, FACS, in 2010. The Citation for Dr. Sheldon’s award was written by ACS Regent Howard M. Snyder, MD, FACS, who had the priceless opportunity to interview Dr. Sheldon and verify details of his life and career. Rather than attempt to paraphrase further, we have asked that the Citation be reprinted here, following our more personal remarks. The news of George’s grave illness and death reached me in Hampshire, England, while I was in the company of two past-presidents of the Royal College of Surgeons of England, Sir Barry T. Jackson, MBBS, FACS(Hon), and Lord Bernard F. Ribeiro, MBBS, FACS(Hon). As three long-time friends and admirers of Dr. Sheldon, we mourned his loss together, talking into the night about his enormous contributions to the world of surgery. The following day we were invited to the House of Lords. Lord Ribeiro wore his UNC tie in honor of his great friend. If you begin with the students he taught at the University of Kansas, Lawrence, when he himself was an undergraduate, you realize that Dr. Sheldon supported and inspired at least three generations of colleagues of all kinds: readers of the classics, writers of history (including my wife Sarita, who referenced George as an authority on 19th Century medicine in her first book), medical students, residents, younger faculty, women surgeons, rural surgeons. The list is endless. For me, George was a source of encouragement in every phase of my career, especially with respect to in my involvement with the ACS, and I know that no one was happier than George when Dr. Anthony Meyer succeeded him as chair of surgery at UNC. I also first met George in San Francisco, about 10 years after Brent, when I was an intern at SFGH in 1977. George was on the faculty with Drs. Blaisdell, Donald Trunkey, Arthur Thomas, Muriel Steele, Robert Lim, and Frank Lewis (all MD, FACS). George taught me most of what I know about surgical metabolism, hyperalimentation, and how to avoid getting into trouble. From the start, he was supportive of my career in academic surgery. We worked together as faculty at SFGH until he left in 1984 to become the Zack D. Owens Distinguished Professor and Chairman of the department of surgery at UNC, and I became his first faculty recruit. George gave me one great opportunity after another, and we worked closely together in different roles until his death. As Dr. Eastman noted, Dr. Sheldon’s greatest legacy is perhaps the legion of younger surgeons he mentored—all the residents and fellows he trained and encouraged, all the young faculty whose careers he helped develop with crucial support, guidance, and introductions. Dr. Sheldon profoundly influenced the careers of many of the surgical leaders of today and was always available to offer advice. As his health faltered, Dr. Sheldon made sure all of his academic responsibilities were covered, including moderating a panel at the 2013 Clinical Congress. He wanted to be involved as long as he could contribute. Dr. Sheldon is survived by his wife Ruth, for whom he cared devotedly during her long illness, and was blessed to be surrounded in his final weeks by their three beloved daughters: Anne Sheldon Anderson, an English-history teacher in Sacramento, CA; Elizabeth “Betsy” Sheldon Terao, with the California State Department of Social Services, Sacramento; and Julie Sheldon, a veterinarian in Carmichael, CA. He also is survived by two brothers, Richard Robert Sheldon II, retired professor and dean of liberal arts at Dartmouth College, Hanover, NH; and William F. Sheldon, director emeritus of the German-American Institute in Nuremberg, Germany, who was also at his bedside in Chapel Hill. We are honored to write this piece for George’s family and his multitude of friends and surgical colleagues around the world. His passing leaves a large void in all our lives, but we take solace in remembering his gifts to us and to our great profession. He was truly one of the giants of surgery of our time. The Lifetime Achievement Award of the American College of Surgeons (ACS) is presented for a lifetime contribution to the art of medicine, surgery and service to the American College of Surgeons. This award, only the second in the history of the College, goes to a richly deserving individual, George Frank Sheldon, MD, FACS. Born in Salina, KS, to a physician father, Dr. Sheldon became involved early with medicine. Because of a severe shortage of medical personnel in rural Kansas during World War II, he started helping out his father in the operating room in his hometown hospital and worked there throughout his high school years. He was also a three-sport athlete. Attending Kansas University, he exhibited an uncommon aptitude for leadership, service and scholarship. For three of his undergraduate years, he held the faculty rank of assistant instructor in the department of Western civilization, and he taught classic literature. He also was elected student body president. At the Kansas University Medical School, from which he graduated in 1961, he co-authored The Doctor, 1861-1961: A Pictorial History of Kansas Medicine in the centennial year of the State of Kansas. He was awarded the L.L. Marcell Award for the highest academic standing in medicine on graduation. After internship and his military service in the U.S. Public Health Service Commissioned Corps, the medical branch of the Coast Guard, he completed a year of fellowship in medicine at the Mayo Clinic, Rochester, MN, followed by surgical residency at University of California-San Francisco, where he did a five-year residency in four years and in his third year received the Helmut Fresca Award for the best resident. After residency, his training continued with a special postdoctoral fellowship from the National Heart Institute with a Research Fellowship in Surgical Biology at the Peter Bent Brigham Hospital of the Harvard Medical School, Boston, MA. He then joined the faculty of the UCSF and achieved promotion to professor in 1980. He participated in the founding of one of our nation’s first trauma centers and became the chief of the trauma service at San Francisco General Hospital which, in addition to UCSF residents, trained Army, Navy, and Air Force surgeons before deployment to Vietnam. He also served as director of the physiological research facility and was among the first physicians on the West Coast to feed patients by intravenous hyperalimentation. In 1984, he was asked to be the chairman of surgery at the University of North Carolina, Chapel Hill, and structured the rapid expansion of department services and extensive recruitment of young surgeons. In 2001, Dr. Sheldon stepped down from that position but was named a professor of social medicine and surgery and continued to teach a very popular history of medicine course and to do health policy research. The UNC named two distinguished lectureships in his honor. The Surgical Interest Group at UNC, for medical students who are interested in surgery, was also established in recognition of Dr. Sheldon. Continuing his scholarship and interest in history, he published the biography Hugh Williamson: Physician, Patriot and Founding Father in 2010 and is working on a book on the life of Philip Syng Physick, long considered the father of American surgery. In 2011 he received the Thomas Jefferson Award, the highest award of all schools of the UNC, for the seven qualities that define the award: ecumenicity of spirit, intellectual distinction, professional superiority, interdisciplinary involvement in the humanities, scholarly productivity, service to the university, and service to the community with a Jeffersonian vision for higher education. Dr. Sheldon’s career with the American College of Surgeons paralleled to his rise to national leadership. A Fellow since 1973, he gave the ACS Opening Lecture at the 1978 Clinical Congress titled Philip Syng Physick: The Father of American Surgery. It was the first Opening Lecture to use slides and was co-authored with his wife Ruth and published in the Bulletin. * From 1979 to 1982, he served on the Board of Governors, representing the Society of University Surgeons. He was the Secretary of the Board of Governors and served on its Executive Committee. In 1984, Dr. Sheldon became a Regent and Chairman of the Communications Committee and the first Editorial Advisor of the Bulletin. In 1985, at the urging of Olga Jonasson, MD, FACS, he and Drs. C. Rollins Hanlon, Oliver H. Beahrs, and David C. Sabiston (all MD, FACS) worked with Sen. David Durenberger (R-MN) to protect graduate medical education funding, which was under attack. His testimony before Congress was shown on C-SPAN and was instrumental in ensuring continued GME funding for a five-year residency. Continuing an interest in trauma, he served on the Committee on Trauma and in 1992 gave the Scudder Oration on Trauma titled, Trauma Manpower. Dr. Sheldon, during his years as a Regent, served on more than 10 ACS committees or task forces. He served as President of the ACS in 1998-1999. During his presidency, the Residents and Associates Society was founded. In 2004, he was the founding editor of the ACS Web portal, now with 28 communities, 200 editors and associate editors, and almost four million page views. He gave the 2009 Edward D. Churchill-Excelsior Surgical Society Lecture on “Surgical Workforce in the Era of Health Reform.” In 2008, he was the founding Director of the ACS Health Policy Research Institute (HPRI) and enlisted the part-time support of 160 researchers at the UNC Cecil G. Sheps Center for Health Service Research. Their work has resulted in more than 70 publications. Dr. Sheldon’s honors are too extensive to cite. He is one of the few surgeons in the last century to have been president of most of the major surgical organizations, including the American College of Surgeons, the American Surgical Association, the American Association for the Surgery of Trauma, the Society of Surgical Chairmen, the Uniformed Services University Surgical Service Visiting Board, and chair of the American Board of Surgery. He is the first surgeon, not a dean, to be Chairman of the Association of American Medical Colleges since 1879. He is a member of the Institute of Medicine of the National Academy of Sciences. 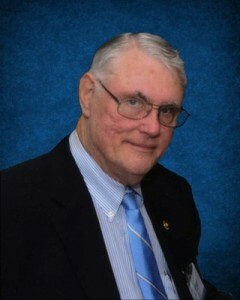 He was a charter member of the Council on Graduate Medical Education when it was founded in 1985. Dr. Sheldon holds Honorary Fellowship in the Royal Colleges of Surgeons of England and Edinburgh, the Association of Surgeons of Great Britain and Ireland, the European Surgical Association, and the Colombian Surgical Association. He is an Honorary Fellow of the Society of Black Academic Surgeons. In 2003, he was named a Distinguished Service Member by the Association of American Medical Colleges. Dr. Sheldon has been an author of more than 400 articles and book chapters on surgical biology, intravenous hyperalimentation, trauma, health policy, and workforce issues as well as history. He has been co-author of eight books and serves on multiple editorial boards. Dr. Sheldon’s regional, national and international preeminence in academic surgery and social medicine distinguishes him even among the elite handful of prodigious educators at the summit of the surgical profession. Dr. George Sheldon has lived a life of remarkable achievement and service to his patients, scholarship, public policy, surgery and the ACS. He richly deserves the American College of Surgeons’ Lifetime Achievement Award. *Sheldon GF, Sheldon RG. Philip Syng Physick, M.D., 1768-1837, The Father of American Surgery. Bull Am Coll of Surg. 1979;64(5):16-27. Dr. Eastman is the N. Paul Whittier Chair of Trauma, Scripps Memorial Hospital, La Jolla, CA; and clinical professor of surgery–trauma, University of California, San Diego. He is President of the ACS. Dr. Meyer is professor and chairman, department of surgery, University of North Carolina, Chapel Hill.